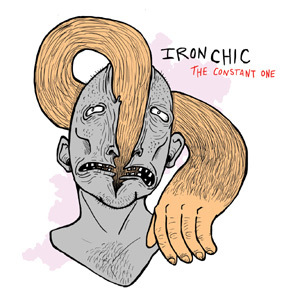 About as metal as they are fashionable, Iron Chic delivered their newly forged album 'The Constant One' in early December; seemingly more than happy to merely carry on where they left off with the 2010 debut album 'Not Like This'. The typical "breath of fresh air" plaudit is hardly an apt description for this particular album; generic, clichéd and "not 'Not like this'" would be a closer description of this latest effort from the Long Island quintet. 'The Constant One' is the band's first album working with Bridge Nine Records, who also happen to boast New Found Glory and Gallows on their books. Sound-wise, this album slots snugly between the two aforementioned bands, managing to sound slightly heavier and more angst-ridden than New Found Glory without having to resort to the undecipherable shrieks employed by Gallows. The album starts off with a short prelude, 'The End', not only borrowing the title of My Chemical Romance's prelude in 'The Black Parade', but also echoing the melody of Smashing Pumpkin's 'Today'. However, this is where the comparisons to these two bands end.